Acknowledged author Mario F. Triola wrote Elementary Statistics comprising 792 pages back in 2017. Textbook and etextbook are published under ISBN 0134462459 and 9780134462455. Since then Elementary Statistics textbook received total rating of 4.5 stars and was available to sell back to BooksRun online for the top buyback price of $68.50 or rent at the marketplace. Note: You are purchasing a standalone product. Real data brings statistics to life From opinion polls and clinical trials to self-driving cars, statistics influences and shapes the world around us. Best-selling author Marty Triola is committed to keeping Elementary Statistics relentlessly current--with an unprecedented amount of up-to-the-minute real data--so that readers of all backgrounds understand the role of statistics in the world around them. In addition to an abundance of new data sets, examples, and exercises, the 13th Edition is designed to be even more flexible, with the addition of learning objectives as an organizational tool, larger data sets, and new topics in line with advancements in statistics. In addition, readers will find more support in an all-new series of videos, more opportunities for practice, and improved support for statistical software. 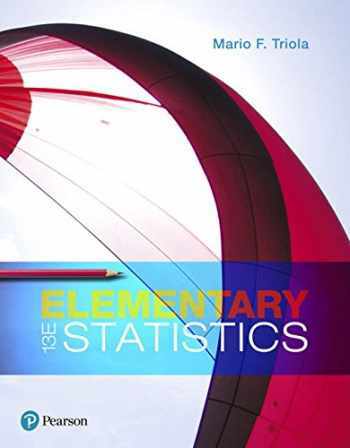 Elementary Statistics is part of a series that also includes an Essentials version as well as technology-specific texts, Elementary Statistics Using the TI 83/84 Plus Calculator and Elementary Statistics Using Excel . Data sets and other resources for this series are available at our website.